left to right, top to bottom: collection concealer, maybelline anti-age eraser eye concealer, rimmel wake me up concealer, maybelline dream pure BB cream, avon natural liquid foundation, bourjous healthy mix foundation, rimmel wake me up foundation, rimmel clear complexion powder. I’ve decided to do a little series for my blog for the next 5 fridays and post basically all my make-up with little mini reviews, because let’s face it, everyone likes to be nosy right? The uninspiring name of the series is ‘Lucy’s Make-up’. I’ve started logically with the bases, so that’s all concealer, foundation and setting powder! Collection Concealer is my savior for any kind of coverage, whether it be under-eye circles or a dodgy spot. It’s a thick creamy consistency and stays put beautifully. Maybelline Anti-Age Eraser Eye Concealer is a good concealer for under eye circles, with a thin, liquidy consistency. It’s a good product but I probably wont be buying it again. Rimmel Wake Me Up Concealer is the perfect concealer for redness or dark circles, it glides on beautifully on the skin and I like to use it when I want a lighter coverage. I adore the Maybelline Dream Pure BB Cream. It surprised me with how thick and good coverage it was, it seems more like a foundation than BB cream. It’s perfect for oily skin but doesn’t have a very good colour range. 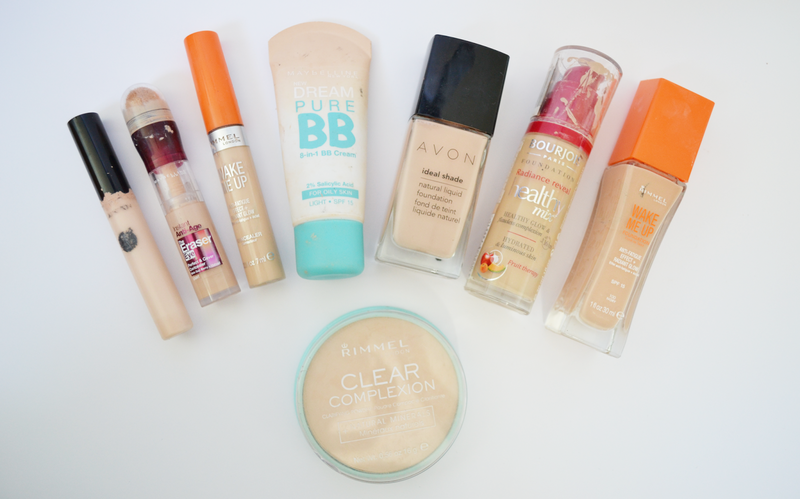 Avon Natural Liquid Foundation seems to be the foundation I always end up going to. It’s a fairly light coverage which can be built up, decent lasting power and is the perfect colour match for my skin tone. Bourjous Healthy Mix Foundation surprised me with the amazing coverage it has, although the lasting power really isn’t that great! Rimmel Wake Me Up Foundation is the perfect foundation for a glowy, duey, fresh-faced look with it’s tiny shimmer particles in. Probably my second favourite foundation after the Avon Natural Liquid. Finally, the Rimmel Clear Complexion Powder, a translucent powder perfect for setting the make-up and getting rid of that unwanted shine throughout the day. Next Friday you’ll get a sneak peek of my mascaras, eyeliners and eyebrow products! What are your top base make-up products?